The following bar graph shows the total production (In thousand tonnes) of Rice, Maize, Barley and Millet in different states. 16) Find the difference between the total rice production to that of total Barley production in all the given states together? 17) Find the average production of Maize in all the given states together? 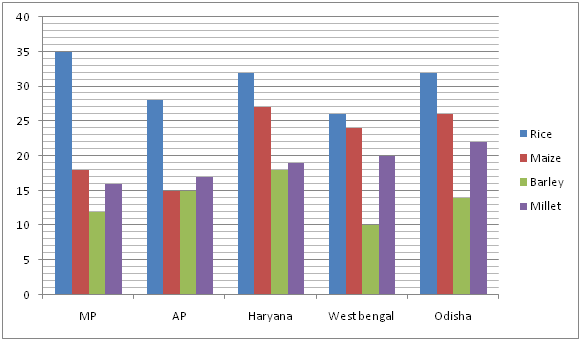 18) Find the ratio between the total production of all the given food grains from AP to that from West Bengal? 19) Total production of all the given food grains from MP is approximately what percentage of total production of all the given food grains from Haryana? 20) The total rice production in Odisha is approximately what percentage more than the total maize production in West Bengal?